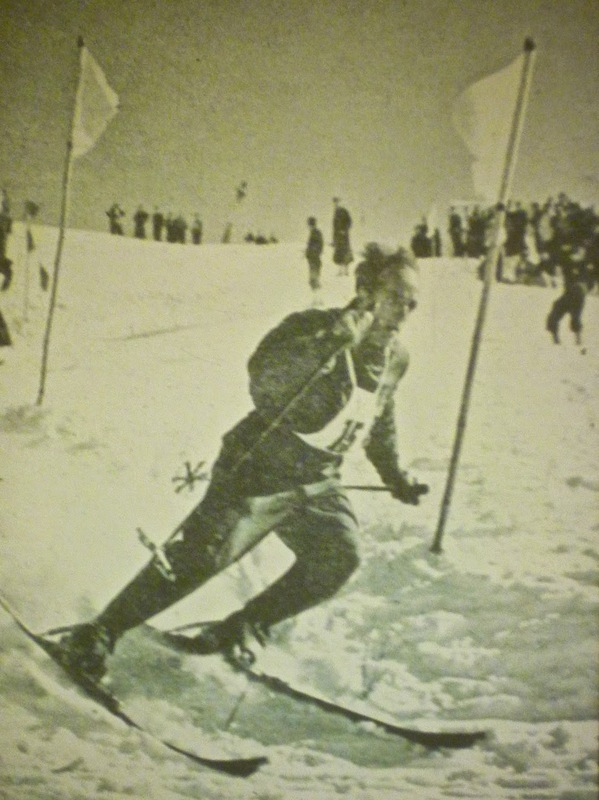 Dr. John Allen and the New England Ski Museum. 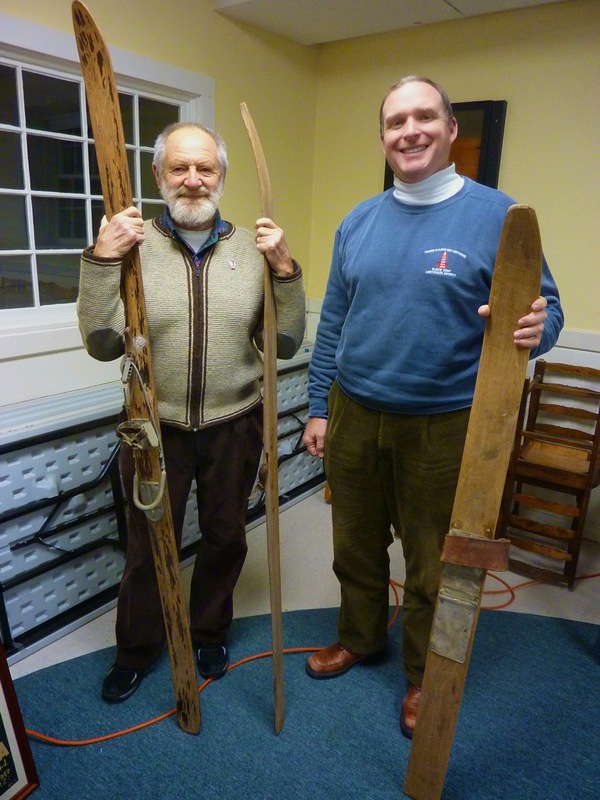 Monday evening, December 8th was a very cold night in town and the appropriate weather to listen to Dr. John Allen speak about the history of snow skiing, particularly in New England and New Hampshire. 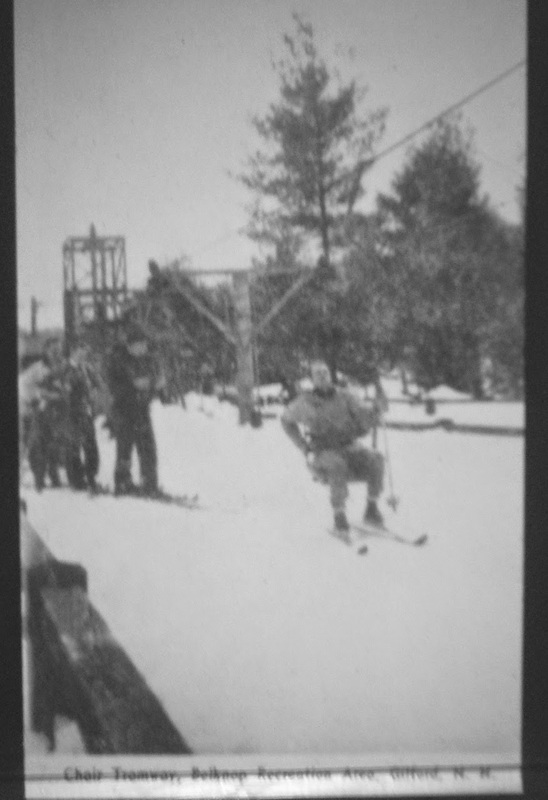 Dr. Allen, a retired professor at Plymouth State College is the secretary and historian at the New England Ski Museum at Cannon Mountain at Franconia State Park. To visit their website click HERE. Society Vice President Neil Benner introduces Dr. Allen to the members. Allen is the author of several books, many articles and has consulted on several movies and documentaries concerning skiing. Dr. Allen, with the aid of slides, explained in detail the growth of this industry in New Hampshire and highlighted the role played by the Dartmouth Outing Club and even the Tenth Mountain Division made famous from their role in WWII. This lift may be antiquated by today's standards but was light years ahead of the "rope tows" that it replaced. This photo was taken at the Belknap Recreational Area in Gilford, NH... or what we call Gunstock today. Conceived in the 1930's and aided by FDR's Work Progress Administration it has grown today to 227 acres or 55 groomed trails with eight lifts that move more than 12,000 skiers per hour. 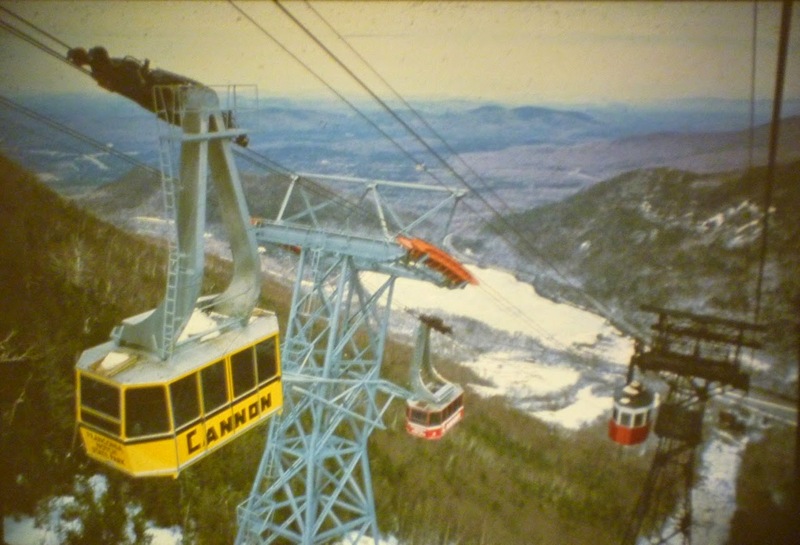 The Tram at Cannon Mountain. The first "Snow Train" departed Boston's North Station on 11 January 1931 for Warner, NH. with 197 skiers. 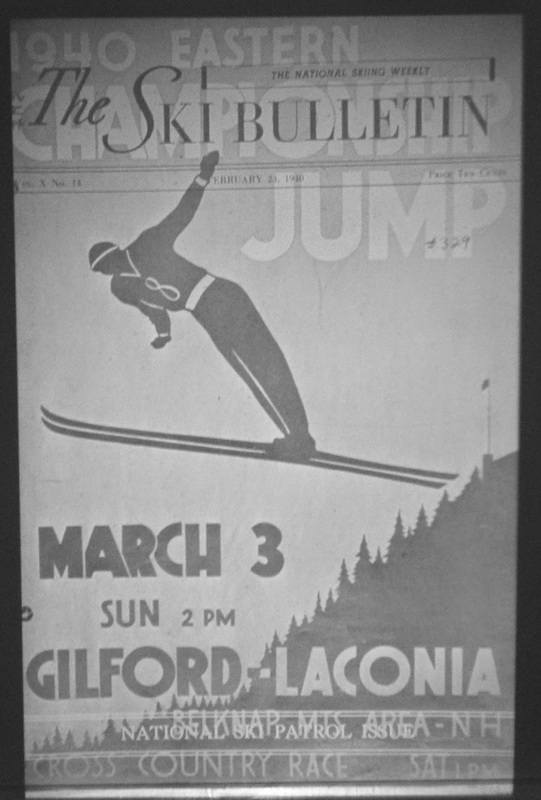 By 1932 though, the destination had changed to North Conway, NH and tens of thousands took to the trains for this day trip of skiing. 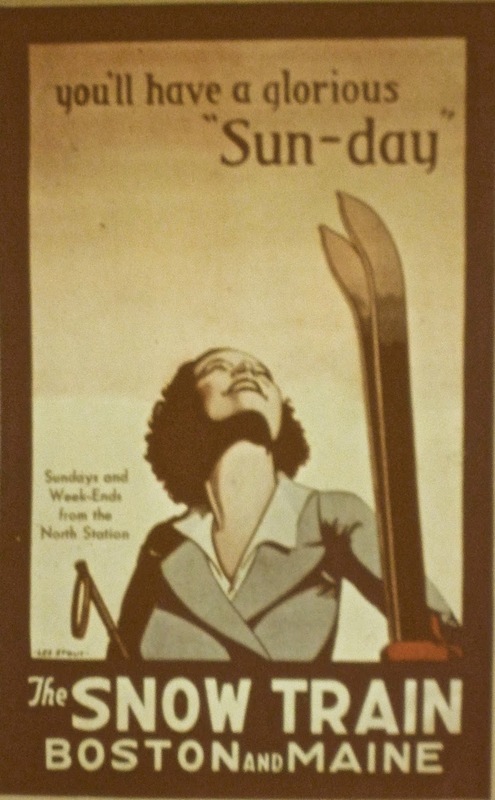 By 1950, with new ski areas opening closer to Boston, Boston-Maine Railroad discontinued service to North Conway. If you ever find yourself in North Conway, a visit to the CONWAY SCENIC RAILROAD is rewarding. Their depot station is full of New England railroading memorabilia including much concerning the Snow Trains. 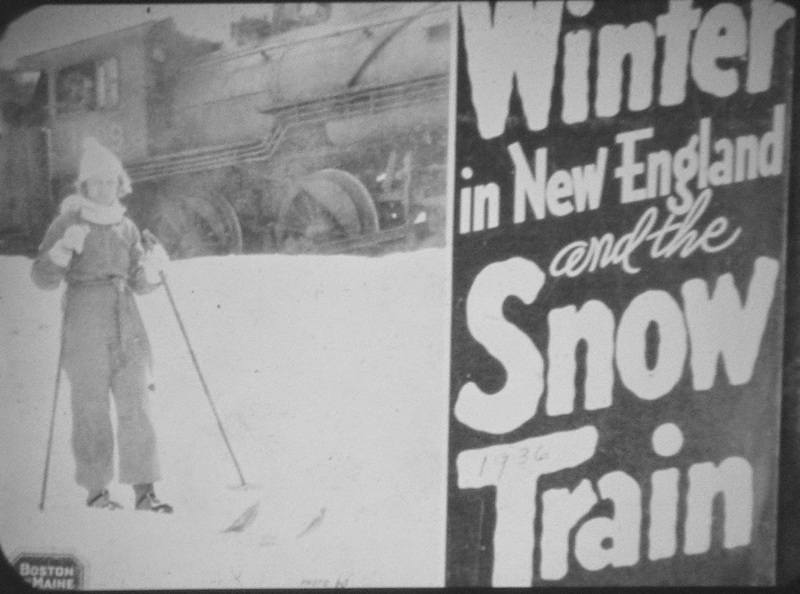 The Snow Train phenomenon wasn't unique to New England, they sprang up nation wide, most popularly in Colorado, Wisconsin, Idaho and Illinois. Click here to read a little history concerning these trains. 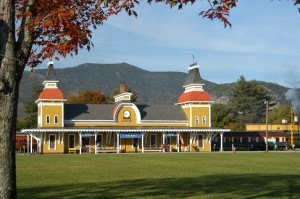 The 1874 Boston-Maine Railroad Station at North Conway, restored and reopened in 1974 as the Conway Scenic Railroad. They maintain and operate 35 miles of track with daily excursions. 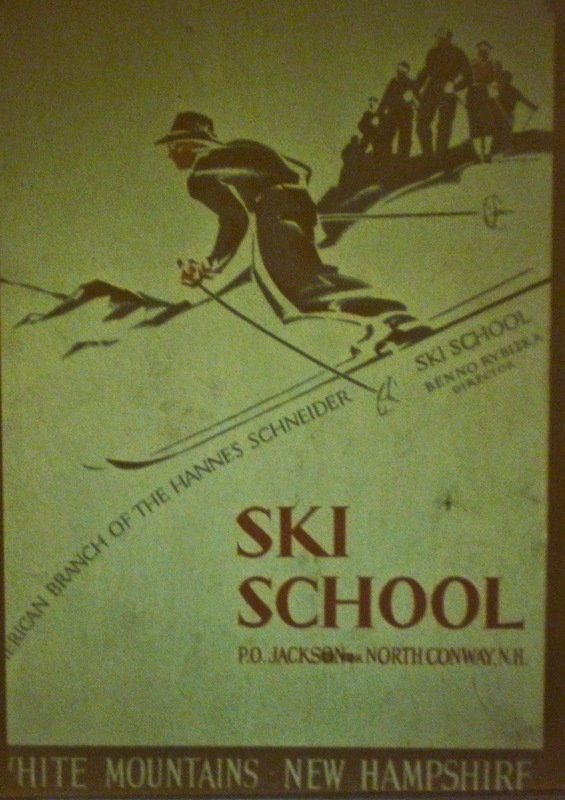 You probably recognize the name Hannes Schneider who fled Nazi occupied Europe in 1939 to open his Austrian style ski school in North Conway at Mt Cranmore. He'd also played a significant role in training the Tenth Mountain Division, now based in Fort Drum, NY. Hannes died in North Conway in 1955. The "Tenth" is a light infantry unit established in 1943 and has a fascinating history. To learn a little of it, click HERE. Slalom racing in the 1950's. 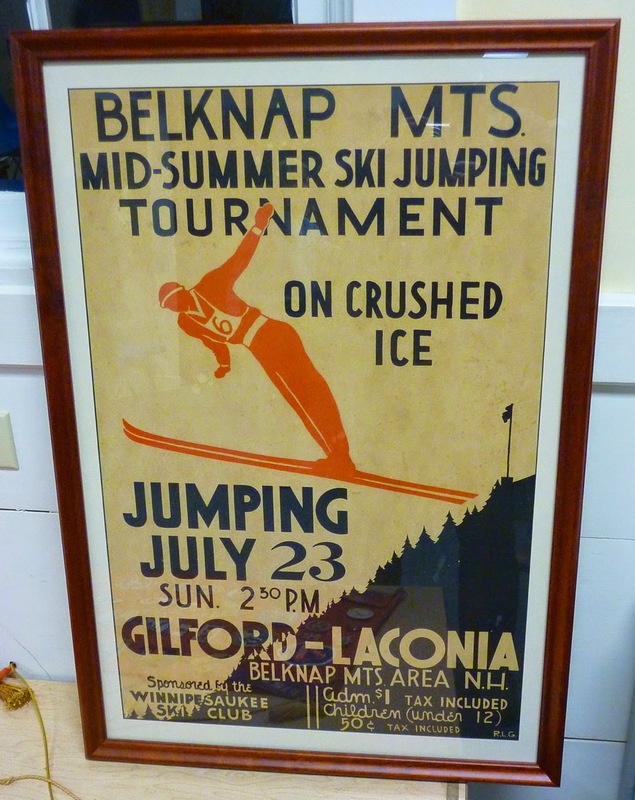 Summer ski jumping at the "Belknap Mountains Area." 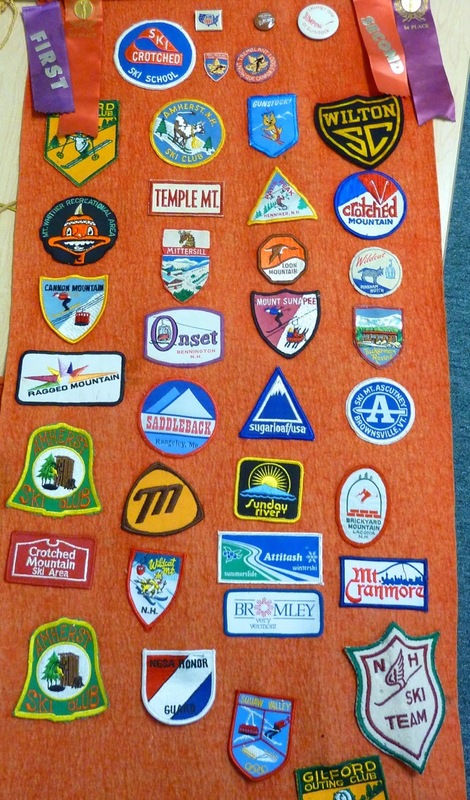 A collection of New England ski area patches and buttons from the 60's and 70's. But these two are probably the most interesting to those of us from Amherst. 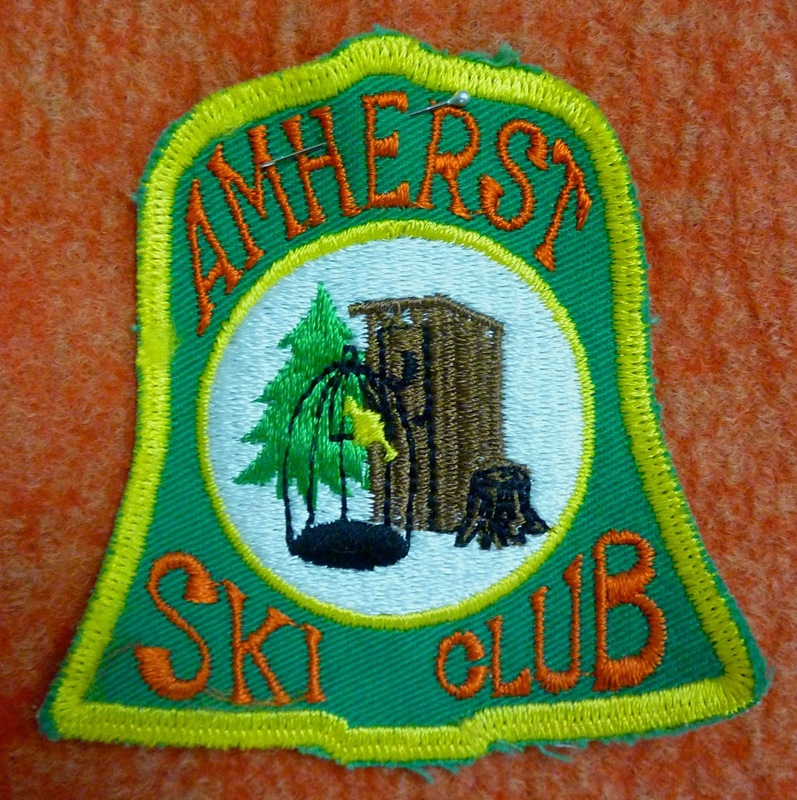 The Amherst Ski Club was created prior to 1964 and skied on Jakes Hill near Christian Hill. In 1964 though they purchased land north of town on Brook Road in Mont Vernon. 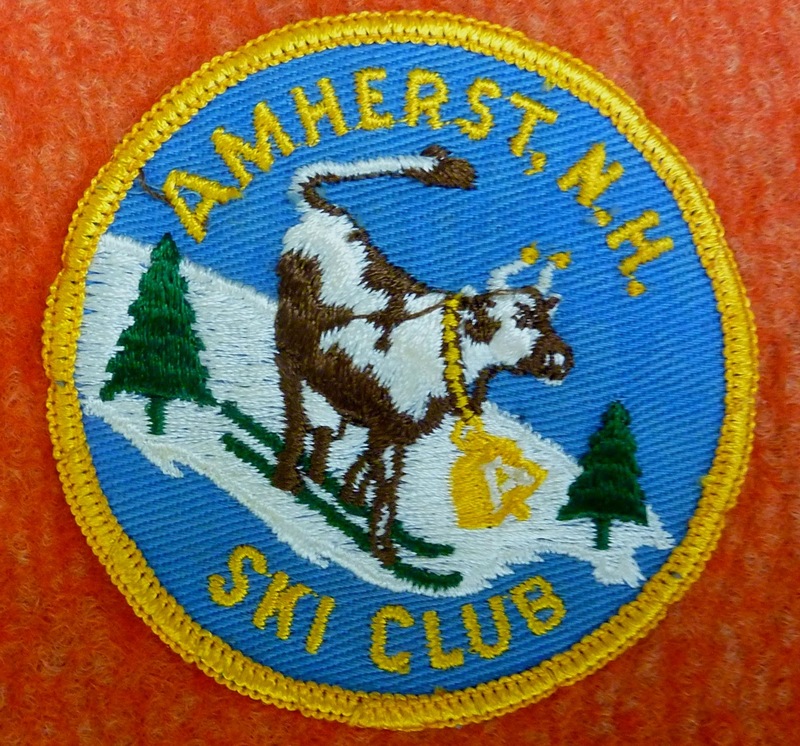 The Amherst Ski Club has an interesting history. Click HERE to read and enjoy photography of this little club. If you've been around here for a while you'll recognize many names and faces on the site. 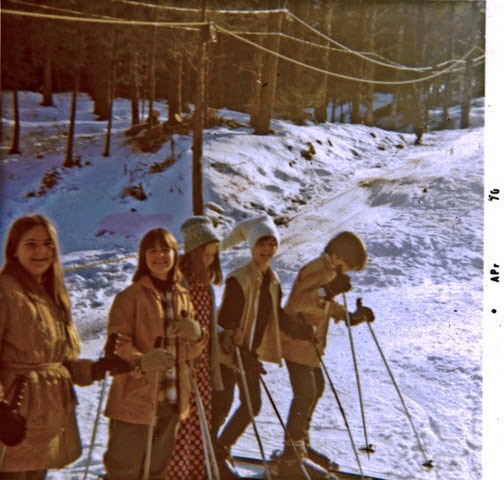 Amherst Ski Club memories with "then" 7th graders: Marie Roberge, Bev Chandley, Joan Hopkins, Peter Terkow and Duncan Carlsmith, probably 1970. From the 40's thru the 80's New Hampshire had nearly 200 "small-town," or "local" ski areas. Heres a LINK that lists all of these wonderful local areas. Here's another site concerning Jakes Hill and the Amherst Ski Club with more detail. Click HERE. We saw many new faces at this meeting. We invite anyone who has an interest in local history to bring a friend and join us on Monday, February 9 to enjoy a lecture concerning SPIES AND SPYING DURING THE REVOLUTIONARY WAR. 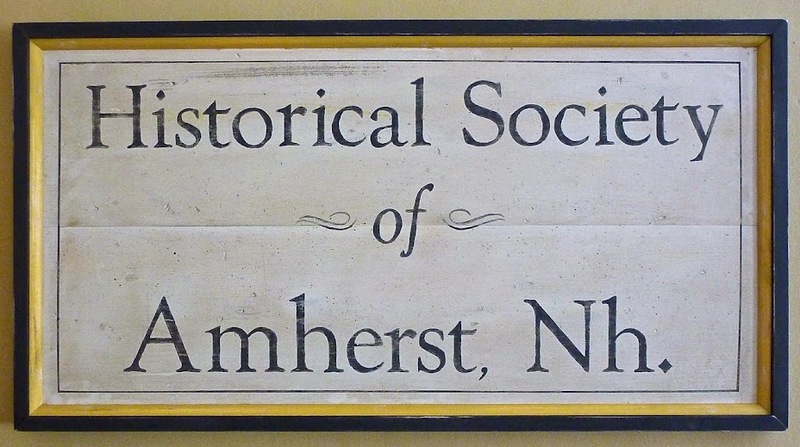 Living in Amherst, you're surrounded by history, we urge you to join us and learn about your town.